They adorn postcards, t-shirts, and dormitory walls around the world, and both are the creation of Gordon Willis. Yes, Francis Ford Coppola had a great deal to do with the composition of The Godfather and Woody Allen deserves credit for much of Manhattan. However, in both cases, it is indisputable that without Willis, neither of these images would exist. And while Willis has been justly praised for his uncanny ability to shoot in the dark, and for his exquisite interplay of shadows and light, his stylistic quiver held more than just a few arrows. He was as adept at the tableau shot as he was at the highly choreographed tracking shot. He moved with ease between color and black and white. He was a master of the slow zoom – perhaps most famous is the opening shot of The Godfather, but my favorite is the painstakingly tense, almost imperceptible zoom into a close-up of Robert Redford’s Bob Woodward in All the President’s Men, as a phone call from Minneapolis leads to his knowledge that the Watergate cover-up leads all the way to the Committee to Re-elect the President. However, despite all that Willis brought to every film he worked on, in the minds of most people the credit for the success of these films inevitably goes to their directors: Francis Ford Coppola’s The Godfather; Woody Allen’sManhattan; Alan J. Pakula’s All the President’s Men. Fairly regularly, of course, credit is given to actors in these films, but beyond that, outside (again) the worlds of industry, academia, and film buffs, little recognition ever lands on the heads of cinematographers, editors, set designers, sound designers, or the many other practitioners who bring their art to bear on the success of so many films. And so Willis’s death has also got me to thinking about the role of the auteurand the insidious ways in which it has cemented much of our thinking about the filmmaking process. New Hollywood, especially, has been considered an age of auteurs – genius directors who are solely responsible for whatever good, whatever art, resides in their films. It’s the era of Scorsese, Coppola, Friedkin, Allen, Bogdanovich, Altman, and so many other men (almost all men) whose persistence and individual vision blazed across cinema screens to light up one of Hollywood’s greatest eras. It’s not only the 1970s though. Go back through Hollywood history (or, to be fair, the history of nearly any national cinema) and it’s the directors names who jump out, whether Hitchcock, Kubrick, and Spielberg, or Goddard and Truffaut, or Antonioni, or Ozu, and so on. It’s become de rigueur in academic film studies to discount or downplay the notion of the auteur, and it’s common parlance to acknowledge that “auteurtheory” isn’t actually a theory. And yet, as soon as the discussion of a film commences, conversations invariably center on the director. University courses on the director abound, but has anybody ever taken a Gordon Willis course? 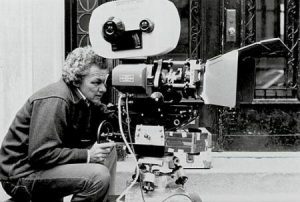 The notion that the director is the sole artist of a film is so embedded in the discourse that any film writing – whether popular or academic – acknowledges such every time a film is mentioned by including the director’s name in parentheses; for example, one of the earliest films Gordon Willis shot was The Landlord (Ashby 1970). The result of this is that nearly the entire apparatus of film analysis is built around the assumption that everything we are analyzing is the work of the director. Thus, we discuss Scorsese’s mise-en-scène, lighting in Fincher, sound design in Cuarón. And we do this knowing full well that much of the mise-en-scène, lighting, and sound in question were actually designed not by the directors, but by set designers, cinematographers, and sound practitioners. We talk about the lovely fastidiousness of Wes Anderson’s framing while ignoring that Robert Yeoman has shot every one of his live-action films; we discuss the flabbiness of Django Unchained, without wondering how much the film missed the guiding hand of editor Sally Menke and, then, how much Tarantino’s earlier films benefited from her enormous talent. This is as true of film history and theory as it is of formal analysis. We all know about Gregg Toland’s innovative contributions to Citizen Kane, but who shotThe Magnificent Ambersons? Did you know it was Stanley Cortez, who also shot The Night of the Hunter, The Three Faces of Eve, and Shock Corridor? Who’s responsible for the filming of the famous opening tracking shot of A Touch of Evil? Russell Metty, who shot several of Douglas Sirk’s best-known films as well as Stanley Kubrick’s Spartacus (amongst over 100 other films!). When we theorize the gaze or the depiction of particular aspects of gender, sexuality, or ethnicity . . . when we debate the representation of the body and what it means about colonialism, patriarchy, or class struggle, we nearly always lay the praise or blame at the foot of the director. Thus we get voyeurism in Hitchcock, violence and misogyny in Peckinpah, depictions of the body in Cronenberg. But rarely a discussion of how these images and themes are framed or lit or dressed in such a way as to heighten or minimize their problematic elements. 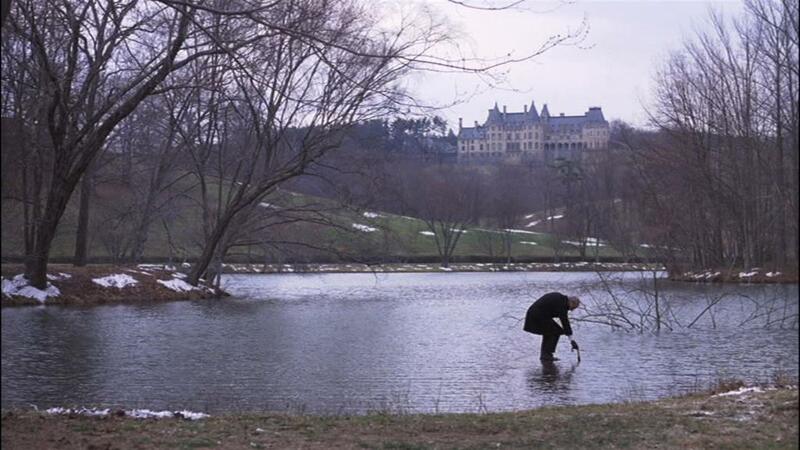 This comes from the final sequence of Being There. It’s a wonderful shot and it’s almost always discussed in terms of Ashby’s audacity in ending his film with Chance walking on water (which does not occur in Jerzy Kosinski’s novel). It’s lovely to discuss the shot (and the entire sequence) as representative of Ashby’s style, his narrative and character inquiries, and so on. But consider this: Being There was a film based on the Kosinski novella; Kosinski had a hand in the screenplay, but it was mainly written by Robert C. Jones; Ashby devised the final shot; Caleb Deschanel shot it; and, on the third take, Peter Sellers chose not to leave his umbrella on land but, rather, take it out on the water with him and dip it in. So, who is responsible for the shot? Can we really give credit for it to any one of those contributors? Without the authorial input of each and every one of them, it wouldn’t have happened. Add to that what you can’t see here – Johnny Mandel’s spare piano score and the voiceover of Jack Warden as the US President, intoning “life is a state of mind” just as this moment occurs, and what we have is an interplay of several artistic styles, approaches, even ideologies. With that in mind, we can then choose to analyze the shot in the context of any or all of those men’s previous and later work. This opens up huge possibilities for better understanding and analyzing any piece of film art. Furthermore, it bestows recognition upon artists who’ve long been overlooked by film studies, or who’ve been at best paid scant lip service. By acknowledging the key stylistic contributions of editors in Hollywood, we discover that women have played a much larger role in the creation of these films than they’re generally given credit. The same can be said about immigrants and people of color, many of whom have shot, written, scored some of the most iconic moments in Hollywood history. To be clear, the role of the auteur in film history is not solely a bad thing. It was with the advent of the auteur era that film studies really began moving away from a focus almost entirely on narrative and acting into the very fruitful areas of formal analysis, which, in its own way, then allowed for much greater theorization of cinema. I’m certainly not calling for the end to all that. Rather, it’s time to expand the notion of what the auteur is, to acknowledge that any person who makes a meaningful artistic contribution to the film is one of its authors. This can’t simply be a talking point. Recently, TV critic Matt Zoller Seitz made waves with a post calling for a more concentrated effort in applying formal analysis to TV criticism. At a recent conference in London, Richard Dyer excited the assembled academics with his defense of formal analysis in Film Studies. Let’s take this energy and expand it, build upon it, so that formal analysis and other forms of film criticism actually include the practitioners who create the form. Why not have a full course on Dede Allen? Why not theorize Roger Deakins’s framing and use of light? Doing so will not only expand our conception of how films are made, but I believe it will actually deeply enrich our understanding of what any particular film or film moment means (or, at least, might mean). Simply put, it will make film studies and film criticism better – deeper and more multi-faceted. But we have a long way to go. A quick look at the Wikipedia page for The Godfather shows Gordon Willis’s name mentioned twice, once in the credits sidebar and once in a description of the DVD extras. That’s it. In a 7000-word entry that includes sections on the film’s production (including filming) and its influence, the man who created its look and devised much of what makes it such a visually absorbing film goes almost entirely unmentioned. Perhaps this will never change. Perhaps the easy fall back onto “director/artist” makes recognizing true authorship too much of a chore. But I don’t think so. I believe if publishers, academic departments, popular critics, all of us who remain endlessly fascinated by film work to push the discussion in the direction of multiple-authorship, of really understanding the communal, dialogic relationship between filmmakers and the films they make, then we will all benefit – writers, students, film buffs, all of us. Let’s cast aside the auteur and really begin to celebrate true authorship. This entry was posted in Previous work and tagged Aaron Hunter, Auteur Theory, Authorship, Being There, Francis Ford Coppola, Gordon Willis, Hal Ashby, Manhattan, The Godfather, Woody Allen. Bookmark the permalink.